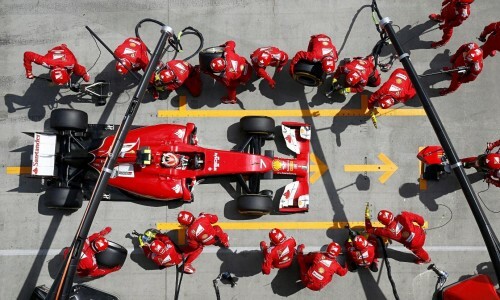 Pit Stop: How does an F1 pit crew work? While drivers and engine manufacturers may take home most of the praise and accountability for wins in F1, the pit crew is usually the component of the team that abides to bear the blame for most of the inopportune events that might occur on and off the track. The crew plays a much greater role in the outcome of a team’s race now given the limited overtaking opportunities that have arisen from the budget disparity amongst Formula One teams. A good pit-stop could be the one element that leads a team to a top of the podium finish; a poorly executed one, more often than not, leads to the driver losing quite a few places and facing an insurmountable challenge for the rest of the race. As a result, the pit crew is as integral to an F1 team’s machinery as the driver and the car itself, with the trio forming the proverbial “F1 Trinity”. Some pit stops have gone down in Formula 1 history for how good or bad they were. All this however begs the question – what does the pit crew actually do during a pit-stop? We all know the duties of an F1 driver and there is an abundance of knowledge of the car’s engine and aerodynamics and what each part actually does. It’s about time we deconstruct the duties of that final member of an F1 team’s three vital components. Who are the members of the pit crew? 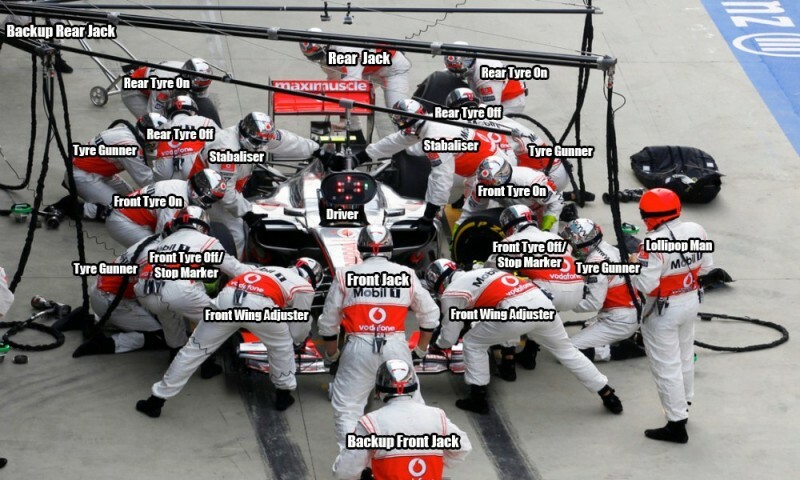 In truth, there are no fixed members in an F1 team who specialize in a certain duty during a pit stop such as tyre changing or stabilizing the car. The pit crew is actually comprised of the team’s mechanics who perform the task of taking part in a pit stop in addition to their other roles. The pit stop comprises of but a small part of their multitude of duties that they undertake. The pit stop roles are usually given based on physical attributes rather than expertise, as the majority of the crew are competent enough to handle any role given to them. As such, jack men tend to be more physically imposing and strong so as to lift the car, while Twheel men tend to be much more agile to quickly change the tyres. The only fixed role in a pit stop is given to the chief mechanic who operates as the lollipop man at the front of the car and oversees the entire procedure from the front and controls the release of the car once the pit crew completes the formalities. With the vast increments in technological advancement that have occurred in car aerodynamics and engine research, it is only natural that pit stops have now also been highly modernized so as to economize on time and increase the efficiency and reliability of the process. Each wheel of a Formula 1 car sits on specific drive pins positioned the axle so that whenever they are removed and a new set is applied, they fit perfectly. In order to minimize time wastage, teams minimize the thread required to actually spin the nut when handling a new wheel. There are minute pockets in the wheel nuts so as to ensure that the wheel gun, when applied, connects automatically with the nut for the torque generated by the gun to easily fix the nut in place. Currently the nut retention system comprises of the wheel gun socket pushing the pins into the axle to remove the nuts and once the refitted nut runs over the pins, they spring out when it is fully fixed. F1 crews use a special kind of wheel gun known as a pneumatic gun which sends pulses of torque to loosen and tighten the wheel nut when applied. The gun has a lighting system which signals when the procedure is done to the pit light system. Wheel men however also raise their hands when they are done so as to remove any room for electronical error. In order to operate on the car when it comes into the pits, the crew needs to raise it off the ground first. To do so, they utilize a modified version of a car jack. F1 jacks possess a quick release feature, where the mechanic pulls a mechanical lever to unhinge the jack, which saves time as it is quicker than lifting the entire jack back up. Swivel jacks are used at the front of the car so that the mechanic and jack can get out of the way as fast as possible and clear the way for the car to move once the process is completed. 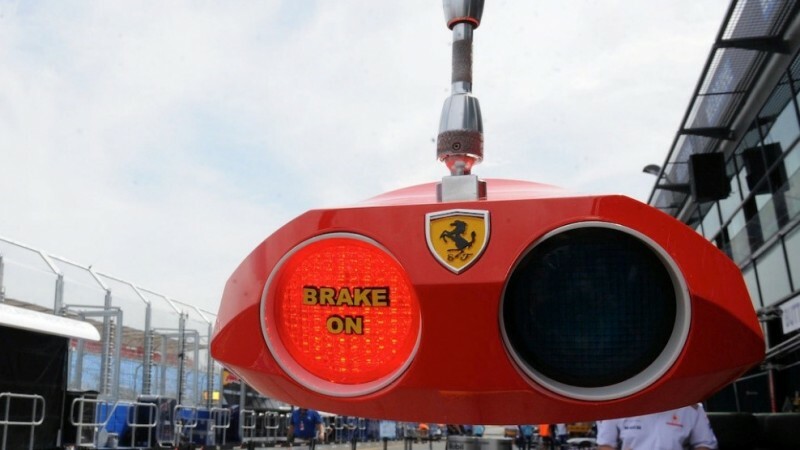 The pit light controlled system was invented by Ferrari and soon enough every team on the circuit followed suit. It compromises of a partly automated system to signal when the car is ready to leave. The lights are connected electrically to the team’s jacks and wheel guns and once all the jacks are off, the light system goes off thus signalling the driver to move. Research is currently being done on facilitating the lights to compute more information such as detecting the proximity of other cars approaching so as to limit the chances of a pit lane accident. There are over 20 members of an F1 team present at a pit-stop. They all need to work together and at an almost robotic level of efficiency if they are to service the car in around 3 seconds. In addition to changing the tyres of the car, the crew also undertakes the responsibility of repairing the front wing or nose in the event of a crash. They do this only after they determine if the car is safe to continue racing post the crash by checking the suspension and electrical components first. As a result, pit-stops are always hectic moments in a team’s race and require absolute concentration and precision from each member of the team. In order to better understand the sheer magnitude of activity that goes on during a pit stop and appreciate the process as a whole to a greater level, each individual role needs to be thoroughly analysed first. Quite possibly the most important and senior member of a pit crew, the lollipop man is in charge of letting the driver know when he can move on after the work on the car is finished in addition to supervising the entire process. When the driver approaches, the lollipop man lets the driver know when to turn in and then runs around to the front of the vehicle with a sign board labelled “BRAKES” to let the driver know that he needs to keep his foot firmly planted on the brakes to prevent the car from moving as work on the wheels is in progress. After all the wheels have been successfully replaced and any other modifications to the car have been appropriately handled, the ‘lollipop’ is turned over to show "FIRST GEAR" to signal to the driver to move into first gear so that he can leave. Only after checking the pit lane for any oncoming traffic will the lollipop man let the car go, so as to avoid any unfortunate pit lane accident. In case the driver has come into the pits as a result of a penalty such as a 10-second stop-go penalty, it is the lollipop man’s duty to keep a track of this time as the electronic pit lights cannot factor this in. Two members of the pit crew are designated as jack men and are responsible for lifting the car up so that the wheelmen can operate on switching the tyres more easily. The two jack men are placed at opposite ends of the car- one at the front and one at the back. When the car approaches the front jack man stands in position at the front of the pit box, armed and ready with the jack in position so as soon as the driver stops, the jack is instantaneously in position under the front wing. The rear jack man however stands to the side away from the pit box and only after the car arrives does he run to the back and position his jack to be mounted onto the rear hooks fastened under the rear wing. Both jack men then lean back to raise the car at the very same time and the car is raised by only about 10cm to minimize both the raising and lowering time while providing the wheel men with more comfort to replace the wheels. After all the wheels have been changed, the car is then gently lowered by the jack men to avoid any damage to the undercarriage. The front jack man then moves to the side of the car as fast as possible so as to give the driver a clear passage out. In order to accomplish this swift movement, the front jack man utilizes a swivel jack so that it can easily be moved out of the way. The rear jack man, however, remains in position and is armed with a starter gun in case the engine fails. Generally each F1 team designates no fewer than 3 members of the crew to supervise the tyre changing at each of the car’s four wheels. The wheel men, armed with pneumatic guns in order to remove the wheels, kneel in place before the car arrives into the pit box and the moment it stops, the guns are placed on the centre nuts of each wheel and a force of torque is applied so as to remove the nut as quickly as possible. The second crew member, who by this time is firmly holding the wheel in place, removes the wheel once the nut is off and signals the third member to bring in the fresh set of tyres. Once the new wheel is brought in, the wheel is slightly rotated as the crew needs to locate the studs that enable the turning of front axle and brakes. Once the located, the gunman pulls a lever on the pneumatic gun to reverse the rotation of the gun. This results in the nut being seated place tightly on the axle. Once this is done, the wheel man removes the gun and raises it in the air to signal lollipop man that work on that wheel is over. As the FIA doesn’t impose any restrictions on teams pertaining to the number of crew allowed to work on the car during a pit-stop, Formula 1 teams possess a variety of extra crew members present during a pit-stop. These extra members have a variety of contingent duties such as those present at the side pod entrances to remove any track debris from the radiators to prevent overheating while some are even employed to clean the driver’s visor should any distracting substance find its way onto the helmet usually with a damp cloth soaked in disinfectant. There are also back up jack men present at both ends should any extra assistance be required. Most of these members are present at the side during the pit-stop and only approach the car should their services be necessary so as to provide more room for the pit crew members performing more vital functions to work with ease. As the driver enters the pit lane he first must reduce his speed to comply with the designated pit lane speed limit of 80km/h. Upon crossing the pit lane line, he engages a pit lane speed limiter that electronically prevents the car from accelerating above the given speed limit. The activation of this limiter automatically signals the fuel filler cap to pop open and all the driver needs to do now is stop exactly at the designated spot in the pit box so as that the pit crew need not waste time in repositioning themselves. The lollipop man first signals the driver to keep the brakes engaged the entire time by flashing the “Brake” sign on his lollipop indicator. Now the car is lifted up by the jack men using the hydraulic jacks while the wheelmen remove the wheel nuts and proceed on to removing the wheels. Once the new set of tyres is reattached using the pneumatic guns, there is a signal that transfers to the electronic pit light signalling that all four tyres have been successfully fitted. This in turn is complemented by each of the wheelmen signalling the same by raising their hands to the lollipop man. The car is now gently lowered down as the jacks as swiftly removed with the front jack man rushing out of the way. The lollipop man now changes the sign on his electronic board to ‘first gear’ to signal the driver to move into first from neutral as the pit procedure is completed. Upon inspecting the lane for any traffic and deeming the pit lane clear enough for a smooth exit, the lollipop man waves the driver away. After leaving the pit lane and disabling the speed limiter, the fuel cap automatically shuts and the driver can proceed with the race. Thus, a Formula 1 pit stop is an intricate arrangement of a multitude of specialized duties that if executed to perfection, forms a piece of art no less beautiful than the very machines on which they work.